Oxford, April 30, 2018 — Oil was never as important to ISIL terrorists as many thought, despite media reports of an oil-related income of as much as US $28 million a week, according to a new study in Energy Research & Social Science. This knowledge supports efforts to weaken terrorist organizations like ISIL, by first understanding how they are funded and how financially stable they are. 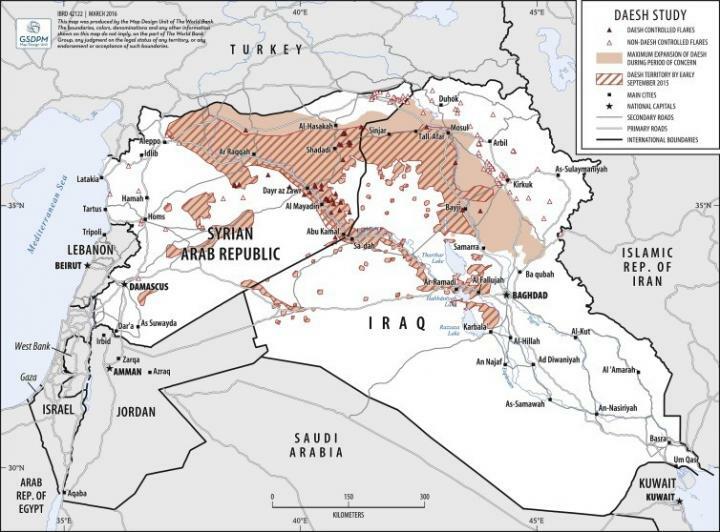 Led by researchers at the World Bank and Princeton University, the new study provides a realistic picture of oil production in areas controlled by the Islamic State of Iraq and the Levant. Such information could inform security and reconstruction strategies. The method allows remote monitoring of extractive activity in conflict areas without the need for reliable data, which can also support public policy, decisions and military operations. "Oil was believed to be a major, long-term source of income for the ISIL terrorist group; assessing this claim was a prerequisite to understanding the financial viability of the organization," said Quy-Toan Do, lead author of the research and Senior Economist at the World Bank. Oil is the world's largest traded commodity. Although its production is well monitored globally, there is an illegal market in which it is produced, refined and traded. This illegal activity provides organizations – including terrorist groups – funding outside government regulation. Understanding the extent of illegal oil production can help work out the strength and size of such groups' operations and funding. This in turn can support efforts to stop them. In the case of ISIL, early analysis suggested that oil may have provided them a durable, long-run revenue stream. The research team wanted to find out if this was the case. They used remote sensing technology to reveal the approximate oil production at specific sites under Islamic State Group control – something that was previously thought to be unknowable. They analysed oil production across Syria and Iraq between March 2012 and November 2016. The results revealed some production in the first few months of occupation, but production quickly fell after ISIL expanded. They found that many of the fields ISIL had occupied were inactive, some were unproductive before ISIL arrived, and some became unproductive during their occupation. The inactivity was due to ongoing conflict as well as airstrikes and an inability to maintain the infrastructure. "Often times debates about the violent potential of non-state groups don't take into account the reality of the challenges these groups face in paying for their activities," said Jake Shapiro, co-lead author and professor at Princeton University. "Our analysis showed that as soon as ISIL took over oil fields, production started to drop, suggesting the group was not as oil-rich as it was often portrayed to be." The remote sensing worked by detecting gas flares. When oil is extracted, gas that's dissolved in it expands and has to be disposed of. That gas is typically burned, and the resulting flares are ideal for remote sensing. The team combined measurements of the flares with measurements of light in the area of the oil fields, so they could distinguish pixel-by-pixel whether there was unusual oil production. They used pre-war oil data to establish the link between the amount of gas flared and the oil extracted, giving them a way to calculate current oil production. "Remote sensing offers opportunities to systematically measure economic activity in areas that were previously impossible or too expensive to reach, helping us find ways to tackle terrorism," added Quy-Toan Do. The research was carried out by a team from the World Bank, Princeton University, NOAA National Centers for Environmental Information, US Department of State, University of Colorado, Brown University and Colorado School of Mines. The article is "Terrorism, Geopolitics, and Oil Security: Using Remote Sensing to Estimate Oil Production of the Islamic State," by Quy-Toan Do et al. (https://doi.org/10.1016/j.erss.2018.03.013). It appears in Energy Research and Social Science, volume 42 (August, 2018), published by Elsevier. Energy Research & Social Science (ERSS) is an international peer-reviewed journal that publishes articles examining the relationship between energy systems and society. ERSS covers a range of topics revolving around the intersection of energy technologies, fuels, and resources on one side; and social processes and influences – including communities of energy users, people affected by energy production, social institutions, customs, traditions, behaviors, and policies – on the other. ERSS is of relevance for energy practitioners, researchers interested in the social aspects of energy production or use, and policymakers.